Foxtel’s favourite lifestyle show Selling Houses Australia, returns next month. Now in its seventh season the Beyond Productions series was the highest rating series for The LifeStyle Channel and ranked as the #1 regular program on Pay TV last year. It was also voted Favourite Program at the 2013 ASTRA Awards. 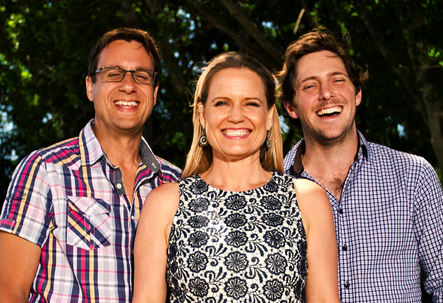 Host and property expert Andrew Winter will again be joined by landscape designer, Charlie Albone, and interior designer and winner of the 2013 ASTRA Award for Most Popular Female Presenter, Shaynna Blaze. Together the team will delve into the real issues faced by property owners today and provide current and practical advice for Australians navigating their way through the real estate market. The team really have their work cut out for them in this series, with 13 episodes, including their biggest makeover yet – a country pub in regional Victoria. Season 7 features properties from all over Australia including: million dollar waterfront mansions; an owner with pink and purple hair to match her pink and purple house; a historic country pub and every home in-between that no one can sell and no one wants to buy. Once again, the team will pull out all the stops to turn them in to saleable properties with spectacular results. Sally has lived in her parents waterfront mansion most of her life. The house has huge sentimental value, but she can’t afford the upkeep and needs to sell. But while some of the house is fabulous and impressive – other parts are terrible – which means it doesn’t cut it as “luxury waterfront”. So what sinister secret is lurking behind the cupboard door that’s sending buyers running? Sue loves all things pink and purple. She has purple hair, wears purple clothes and drives a hot pink ute. But her love of colour doesn’t stop there. Sue has extended her personality into her home, and her decorating style is leaving buyers eyes black and blue. Little wonder no one will pay $2.6 million for her disco inspired country estate. And with a house the size of a large suburban block and 7-acres of land, this is a makeover on a grand scale. Ever dreamed of owning a nice little pub in the country? Think again. Barney and Barb thought their country pub would give them an idyllic lifestyle where they could work and play together; the reality was a 24/7 commitment working 7-days a week, 14-hours a day. The couple purchased the leasehold on the run down pub in Alexandra, Victoria 3-years ago. They worked tirelessly to turn the place from bankrupt to the most popular pub in town. They’re pillars of the community raising thousands of dollars for charity, but their efforts have taken their toll, physically, emotionally and financially. Despite their hard work, the pub is struggling to make a profit and now they just want out. Wednesday, February 5 at 8.30pm on LifeStyle. Great show thanks to a warm and natural cast.